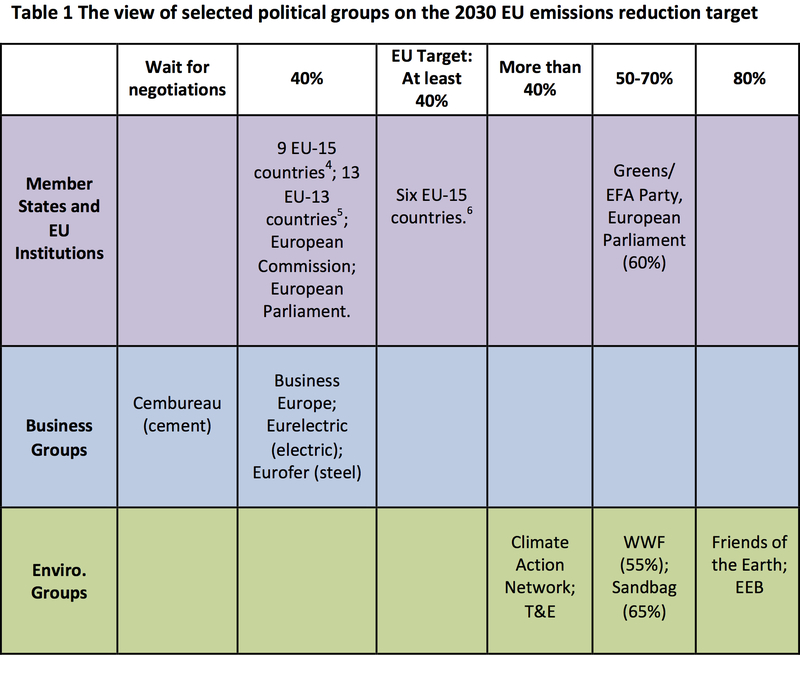 The Politics of Climate Ambition: The EU’s 2030 Emissions Target on the Road to Paris | Environmental Europe? But how ambitious is the EU’s 2030 target? After all, at the Lima climate talks on December 3, developing countries called for a 40% cut from developed countries by 2020, not 2030. Research on climate-change related emissions, including recent data from the Global Carbon Project, also suggest that the EU is not doing enough. And in a recent blog post, IPCC author Niklas Höhne reviews other studies which suggest that the EU needs to cut emissions anywhere from 40% to more than a 100% by 2030. These differences in what ambition means rest in part on what amount of climate change is considered dangerous for human society. The EU and some other countries have historically pushed for limiting the global rise in average temperature to 2°C over pre-industrial levels, a target which was endorsed in the 2010 Cancun Agreements. The 2°C target has been critiqued and may not be feasible. Nevertheless, it has played a key political role as a “focal point” in international negotiations and within the European Union. If 2°C is the goal, how much does the EU have to cut its greenhouse gas emissions, and by when? The answer depends on, among other things, how nations agree to divide up mitigation responsibility and whether technologies to remove greenhouse gases from the atmosphere can be developed in the next few decades. In addition, climate mitigation ambition depends crucially on agreements at the international level. For example, if in 2011 the EU had cut 100% of its greenhouse gas emissions, the global increase in emissions between 1990 and 2011 would still have been 27%. Given the spectrum of opinion on how to define “climate ambition”, my goal in the rest of this post is to explore how political actors in the European Union define an ambitious 2030 target. I therefore reviewed positions on the 2030 target held by EU Member States, the European Commission, the European Parliament, business groups, and environmental groups (Table 1). Member State positions are based on information reported by Euractiv prior to the final European Council agreement. The positions of environmental groups and business groups came from their answers to a European Commission consultation on the EU’s 2030 climate strategy, as well as press releases in reaction to the 2030 target announcement on October 24. The “at least 40% by 2030” target may not be the end of the story. As the “at least” qualifier suggests, the EU could strengthen its emissions reduction commitments in the wake of a strong international agreement in Paris. For example, the UK government has explicitly supported “…a target of up to 50% in the context of a global comprehensive agreement.” But it is unclear what level of cuts by other major emitters such as the US and China would be enough to convince the EU to increase its ambition. And if a comprehensive climate agreement is not forthcoming in Paris, there is precedent for a weak global deal blocking further ambition in the EU. European negotiators went to the 2009 Copenhagen climate summit with an offer to increase their 2020 target from a 20% to a 30% cut if other nations proposed comparable measures. However, the EU was rebuffed and Copenhagen produced a weak outcome. Afterwards, the European Commission attempted to convince member states to increase to a 25% 2020 target unilaterally. But the Polish government blocked the proposal because of concerns about the economic effects of emissions reductions. Therefore, in the coming months it will be important to watch both the outcomes of the climate negotiations in Paris and how the European Union reacts to those outcomes. As it stands, the EU will go to Paris with the “at least 40% by 2030” emissions reduction target. Will the target, along with recent commitments by nations such as China and the U.S., be enough to push forward a comprehensive global agreement? If that agreement is reached, will it be ambitious enough for Poland and other cautious Member States to support an increased EU 2030 target? Will all of this be enough to stay below a 2°C rise in global temperatures? There are no clear answers to these questions. What is clear, however, is that the next two years will be a crucial period for climate change politics, both globally and in the European Union. Cuts of more than 100% assume that negative emissions technologies are available. See: Okereke, C. 2010. Climate justice and the international regime. WIREs Climate Change (paywall). Author’s own calculations, based on data from the World Resources Institute. Austria, Belgium, Finland, France, Greece, Ireland, Italy, the Netherlands, and Spain. Bulgaria, Croatia, Cyprus, Czech Republic, Estonia, Hungary, Latvia, Lithuania, Malta, Poland, Romania, Slovakia, and Slovenia. Denmark, Germany, Luxembourg, Portugal, and the United Kingdom. Based on: Skjaerseth, Jon Birger. 2013. Unpacking the EU Climate and Energy Package: Causes, Content and Consequences, pg. 35. This entry was posted in Energy & Climate Change, Environment, Politics & Public Policy, Science & Technology, The EU, Uncategorized. Bookmark the permalink.